The Eighth Regiment, Virginia Infantry, (of the Union Army) was organized in the Kanawha Valley, by Major John H. Oley, during the fall of 1861, headquarters being at Charleston. The regiment was ordered to New Creek in April, 1862, becoming a part of General Fremont’s Mountain Department, and with the Sixtieth Ohio Infantry, was organized as an advance brigade, and placed under the command of Colonel Cluseret, A.D.C. to General Fremont. In the pursuit of Stonewall Jackson up the Shenandoah Valley, this brigade had the advance, and were engaged in several skirmishes with Turner Ashby’s cavalry, following him closely to Harrisonburg, where they engaged him, resulting in the death of Ashby. This brigade occupied the center at the Battle of Cross Keys and was complimented by General Fremont for its gallantry. The regiment became a part of General Bohlen’s brigade, Sigel’s Corps, in General John Pope’s campaign, and served with great gallantry in all the engagements of that campaign, including the Second Battle of Bull Run. On arriving at Washington, D.C., the regiment was transferred to General Milroy’s brigade, and returned with him to western Virginia, and was again assigned to duty in the Kanawha Valley. In November, 1862, it was transferred to Colonel Moor’s brigade. On the assignment of General Averell to the Fourth Separate Brigade, this regiment was mounted, and became a part of his brigade, as the Seventh West Virginia Cavalry, with which it served as long as the organization existed. The regiment spent the last years of its term in the Kanawha Valley, occupying the following different posts: Charleston, Coalsmouth, Winfield, Point Pleasant, and Guyandotte. Early in January two or three brigades of Confederate troops were sent to winter in the counties immediately in the front of these posts, and the regiment was kept very actively engaged during the winter, to prevent incursions by them, and in the protection of loyal citizens and their property. Several small engagements took place, in which a number of the enemy were killed, and about two hundred prisoners taken. About the 1st of February, 1865, six officers and nearly one hundred fifty men were discharged by reason of expiration of term of service, but the regiment was immediately filled to the maximum by the muster-in of recruits. From the time of the surrender of Lee’s army the regiment was engaged in patrolling the twenty counties of southwestern Virginia, composing the District of Kanawha, for the purpose of paroling returned Confederates and maintaining order in the country. Over 5000 Confederates were paroled by the officers of this regiment. 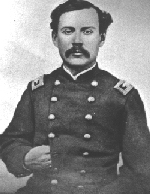 In June, 1865, Colonel John H. Oley, who had been in command in the Kanawha Valley for a year previously, received an appointment as Brevet Brigadier-General, to rank from March 13, 1865, for gallant and meritorious service in West Virginia. The regiment was mustered out at Wheeling, West Virginia, on August 1, 1865. The regiment lost during the war: killed in battle and died of wounds, 5 officers and 28 enlisted men; died of disease or accident, 2 officers and 201 enlisted men; total, 236. Organized at Buffalo, W. Va., November, 1861. Attached to District of the Kanawha, W. Va. Unassigned to May, 1862. Cluseret’s Advance Brigade, Dept. of the Mountains, to June, 1862. Bohlen’s Brigade, 3rd Division, 1st Corps, Pope’s Army of Virginia, to September, 1862. Milroy’s Independent Brigade, Defences of Washington, D.C., to October, 1862. Point Pleasant, W. Va., District of the Kanawha, W. Va., Dept. of the Ohio, to March, 1863. Averell’s 4th Separate Brigade, 8th Army Corps, Middle Department, to June, 1863. Averell’s 4th Separate Brigade, Dept. of West Virginia, to December, 1863. 3rd Brigade, 4th Division, Army of West Virginia, to January, 1864. SERVICE.–Post duty at Buffalo, W. Va., till April, 1862. Ordered to New Creek, W. Va. At Franklin till May 25. Pursuit of Jackson up the Shenandoah Valley May 26-June 19. Mt. Carmel Road near Strasburg June 1. Strasburg and Staunton Road June 1-2. Harrisonburg June 6. Battle of Cross Keys June 8. Port Republic June 9. Moved to Strasburg June 19-22, thence to Middletown June 24, and duty there till July. Middletown July 7. At Winchester till August 2. Pope’s Campaign in Northern Virginia August 2-September 22. Fords of the Rappahannock August 20-23. Freeman’s Ford August 22. Sulphur Springs August 23-24. Waterloo Bridge August 25. Gainesville August 28. Groveton August 29. Bull Run August 30. In the Defences of Washington, D.C., till September 29. Moved to Mt. Pleasant, W. Va., September 29-October 9. Outpost duty at various points in District of West Virginia, till June, 1863. Skirmish, Gilmer County, W. Va., April 24, 1863. Regiment mounted at Bridgeport June, 1863. Moved to Grafton June 17. Beverly July 2-3. Huttonsville July 4. Moved to Cumberland, Md., July 7. Hedgesville and Martinsburg July 18-19. Averell’s Raid through Hardy, Pendleton, Highland, Bath, Greenbrier and Pocahontas Counties, W. Va., August 5-31. Huntersville August 22. Warm Springs August 24. Jackson River August 25. Rocky Gap near White Sulphur Springs August 26-27. At Martinsburg till November, Averell’s Raid against Lewisburg and the Virginia & Tennessee Railroad November 1-17. Mill Point November 5. Droop Mountain November 6. Covington November 9. Averell’s Raid to Salem on Virginia & Tennessee Railroad December 8-25. Gatewood’s December 12. Covington, Jackson River and Scott’s or Barber’s Creek December 19. At Martinsburg till January, 1864. Designation changed to 7th West Virginia Cavalry January 26, 1864. Organized from 8th West Virginia Mounted Infantry January 26, 1864. Attached to 3rd Brigade, 4th Division, West Virginia, to April, 1864. 3rd Brigade, 2nd Cavalry Division, West Virginia, to June, 1864. 2nd Brigade, 2nd Cavalry Division, West Virginia, to July, 1864. 1st Separate Brigade, Kanawha Valley, W. Va., to August, 1865. SERVICE.–Duty at Martinsburg and Charleston, W. Va., to April, 1864. Crook’s Raid on Virginia & Tennessee Railroad May 2-19. Rocky Gap May 6. Cloyd’s Mountain May 9. New River Bridge May 10. Cove Gap May 10. Blacksburg May 11. Union and Pond Mountain Gap May 12. Meadow Bluff May 24. Hunter’s Raid to Lynchburg May 26-July 1. Buffalo Gap June 6. Lexington June 11. Buchanan June 13. New London June 16. Diamond Hill June 17. Lynchburg June 17-18. Liberty June 19. Buford’s Gap June 20. About Salem June 21. At Loup Creek June 29. Ordered to the Kanawha Valley and duty at Charleston, Coalsmouth, Winfield, Point Pleasant and Guyandotte till August, 1865. Coalsmouth September 30, 1864. Skirmish at Winfield October 26, 1864 (1 Co.). Operations in the Kanawha Valley November 5-12. Mustered out August 1, 1865.